Vision Forum node New Cities Project presents a selection of artworks, books and ephemera related to British architect and educator Jane Drew at ICA in London. 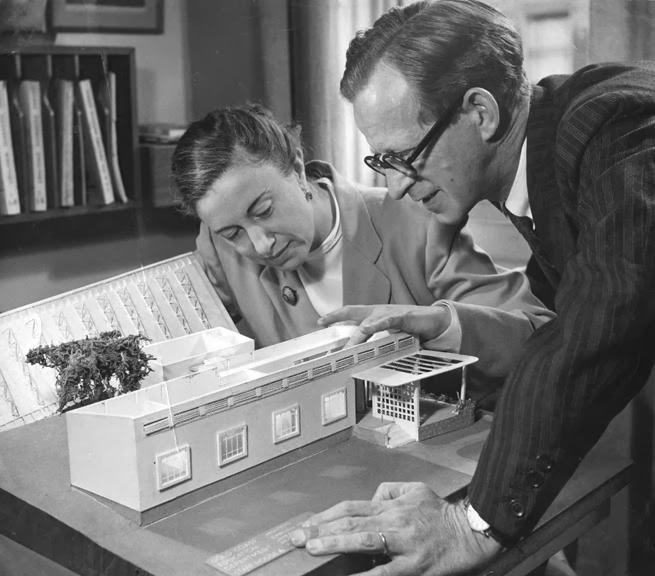 Jane Drew (1911-1996) was a British architect and educator. Her work signaled a major shift from universal modernism to responsive and vernacular design. Drew was an instrumental agent across the projects and fields of urban and domestic design in which she worked, yet has remained unrecognised relative to her male contemporaries. She began her career designing ergonomic kitchens and was responsible for the standard height of ovens that is still used today. A close ally of Paolozzi, Moore and Hepworth, Drew can be credited for securing the premises of the ICA (both at Dover Street in 1950 and The Mall in 1968) where she with others collectively re-designed the interiors including the fittings and furniture. Contemporary art was fundamental to her designing process and while working with her husband Maxwell Fry, she commissioned artworks as integral elements within building projects – which in the UK included social housing and public infrastructure in London and various New Towns. During the 1950s, working in the partnership of Fry & Drew, she began designing buildings internationally in the newly independent states of India and Iran and the soon to be decolonised Nigeria. Drew was a galvanizing force who instigated ambitious international projects with often conflicting and jealous team members. Drew proposed to the Indian government that Le Corbusier be the mastermind behind the construction of the new capital of Punjab following partition. She was responsible for much of the low-income housing in Chandigarh and played an important role in re-housing the city’s existing residents and migrant workers. Significantly, Drew and her partner Fry published books and taught ‘Tropical Architecture’ at the Architectural Association. A body of knowledge developed after significant experience in West and North Africa and India was formalised into architectural instruction, which incorporated traditional building methods into the modernist style. While such ideas remain problematic in a post-colonial context, this reappraisal of the vernacular presents a rupture within the modernist dogma instituted by the likes of Le Corbusier, which insisted on a progressive universal style. Throughout her international career, Drew remained committed to contemporary artists and did not see her work in Africa and Asia as distinct from the public building and exhibition projects in the UK. Rather, her life and work demonstrates how the histories of Twentieth Century British art and architecture are intricately bound to developing global conditions emergent in the wake of the Second World War. Jane Drew (1911-1996): An Introduction will include a selection of artworks, books and ephemera and will be accompanied by a related talks and events programme. Highlights include a collage by Eduardo Paolozzi from 1957 which is a study for a work commissioned by Drew and Fry for their offices. In addition a sculpture by Lynn Chadwick called Watcher VII from 1961 will be on display which was a maquette for a public sculpture commissioned for Harlow, which Drew worked on. This exhibition is part of New Cities, a long-term research project initiated by Inheritance Projects as part of Vision Forum. Inheritance Projects is an independent research-led curatorial group led by Claire Louise Staunton and Laura Guy. Initiated in 2007 as a vehicle to interrogate museological schemata, the narrations of history and personal and national heritage, Inheritance has developed into wider territories of investigation. Inheritance works with artists, architects and writers in collaboration with institutions to produce new art projects and to develop politically informed, critical discourses around particular topics or situations. These situations are often defined by their histories (museums and heritage spaces) or their relative newness (New Towns internationally) and are the contexts for long-term research projects. Recent projects include, Intentions - Strategies – Works at Tate Liverpool, Open Letter at Sarai New Delhi and Chandigarh, Ulterior Vistas Tris Vonna-Michell at BALTIC, Missing Houses Support Structure at Nottingham Contemporary and Community without Propinquity at MK Gallery.